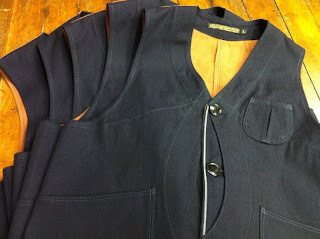 In need of some inspiration and not wanting to miss an opportunity, I made the short trip to Pasadena this past Saturday to visit Rising Sun & Co. in order to pick up one of their fantastic Outdoor Vests. A recent post via the Rising Sun blog announced that a small run was just finished up in sizes large & xtra large for us regular sized guys. 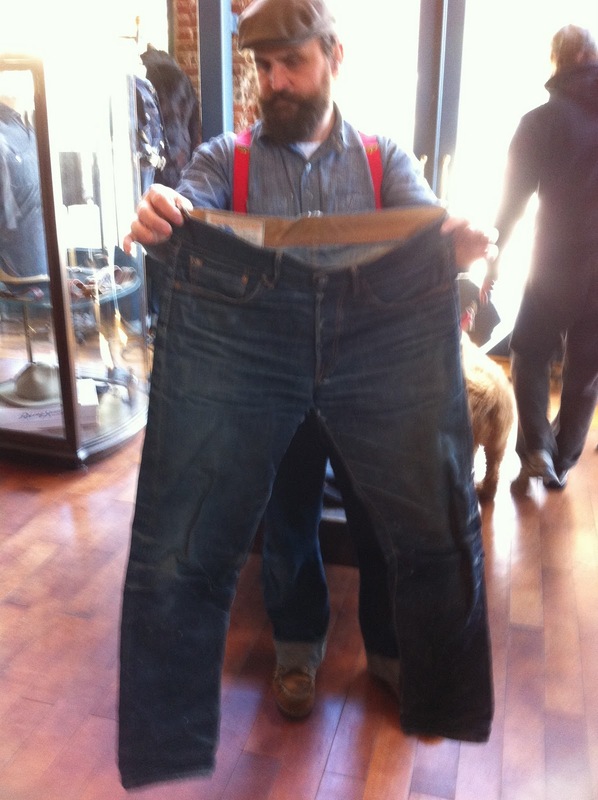 This was my first true retail purchase in some 3 odd years, paid for with hard earned dollars (I picked up 2 newsboy caps from RRL about same time last year with some B-day money, that doesn't count). 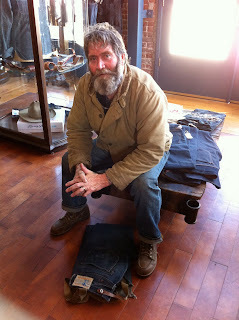 I can't express just how good it feels to spend some non-disposable income on a quality garment made by quality people here in the good old USA. Display cases filled with Indigo & Duck goods. Oh yeah, that floor is leather. Details, details, everywhere you look... such nice details. The new batch of Outdoor Vests. 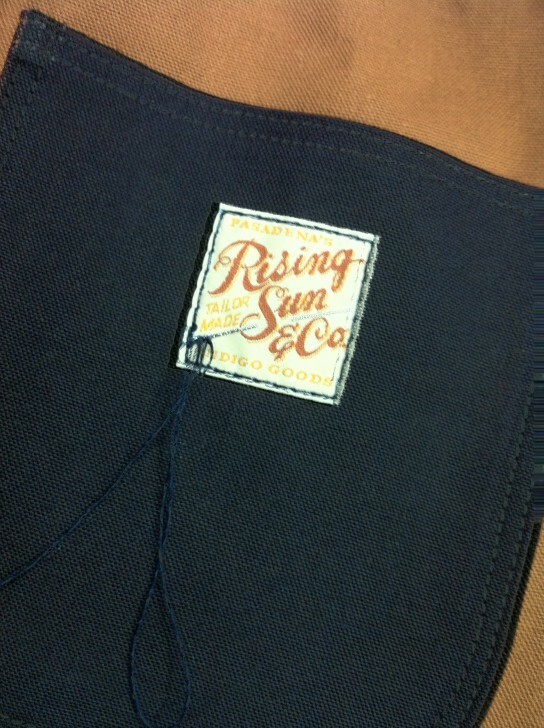 Full warp & weft indigo dyed Cone Mills selvage canvas front paired with brown selvage canvas back, via Rising Sun. Marion B. keeping it real. 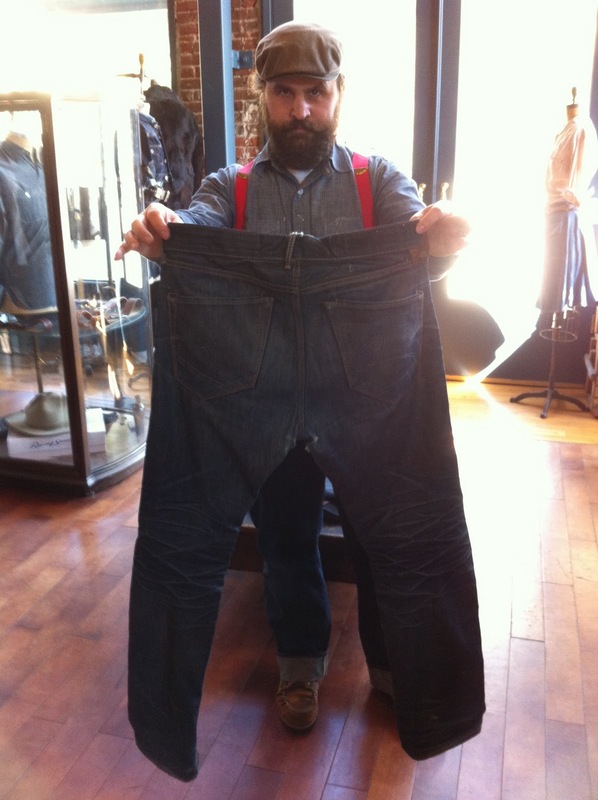 Mike showing off a pair of Rising Sun jeans fresh from a customer in Japan, where they were worn for 2 years straight, resulting in some crazy authentic wear including fade, whiskers & hige. Just a few of the many buttons and rivets in the workshop. 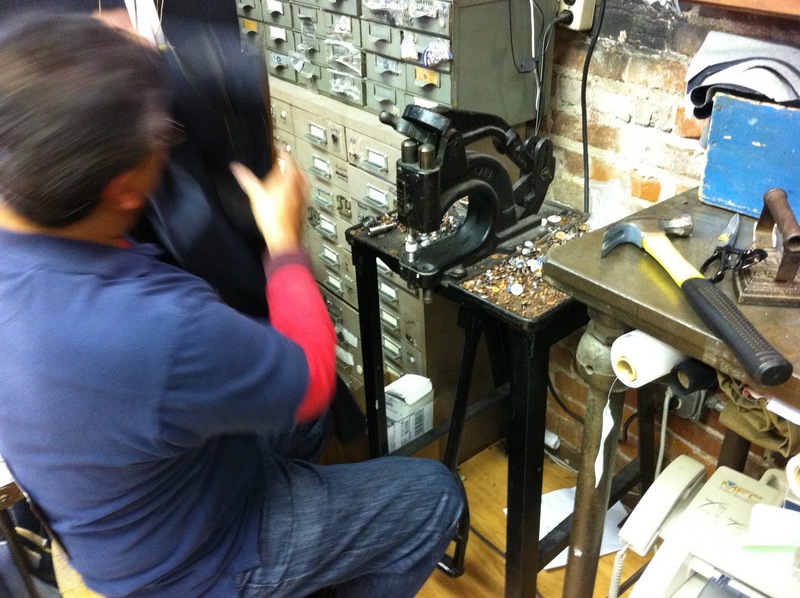 Master tailor Bellar at the rivet press. Nothing like a true workshop showing signs of real use. Mike was gracious enough to share his time and passion along with some of the truly fantastic pieces that he's currently working on. Inspired by vintage Stiffel cloth, Wabash and other stamped fine stripe fabrics along with some seriously authentic washes & finishes, I'm already starting a fund for when these become available. Beautiful fine stripe herringbone twill sack coat in the works. 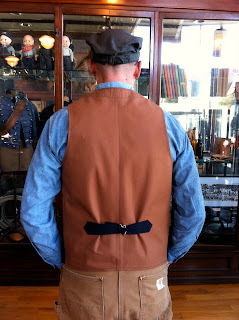 My new vest..one happy customer. I will be taking some detailed pictures of the vest including some before and after shots showing break in & wear for a future post. Note how much darker the vest's brown duck is compared to my 70's era Carhartt "horseshoe" double front work pants. A little token of my appreciation. 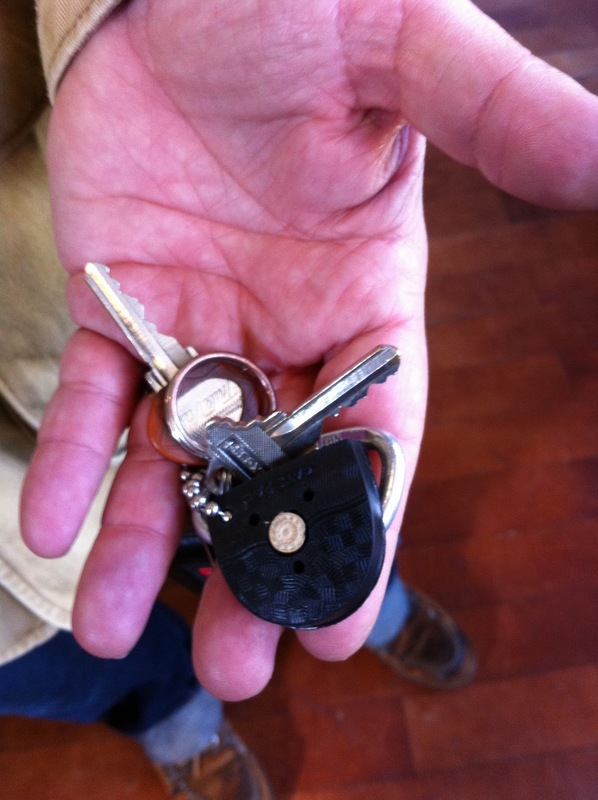 Authentic vintage Cat's Paw key chain I gave to Mike that he immediately added to his key ring. 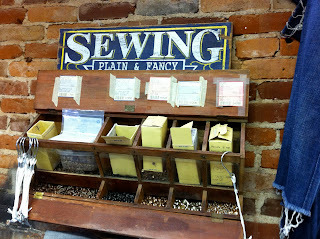 All in all a very nice visit to a wonderful shop. Home to some of the most authentic and highest quality indigo & duck canvas clothing in the world (right here in our own backyard), not to mention the friendly & knowledgeable folks behind the goods. I can't say enough positive things about Mike & Bellar, what they are doing outta this fantastic shop in Old Town Pasadena and just how they are doing it. 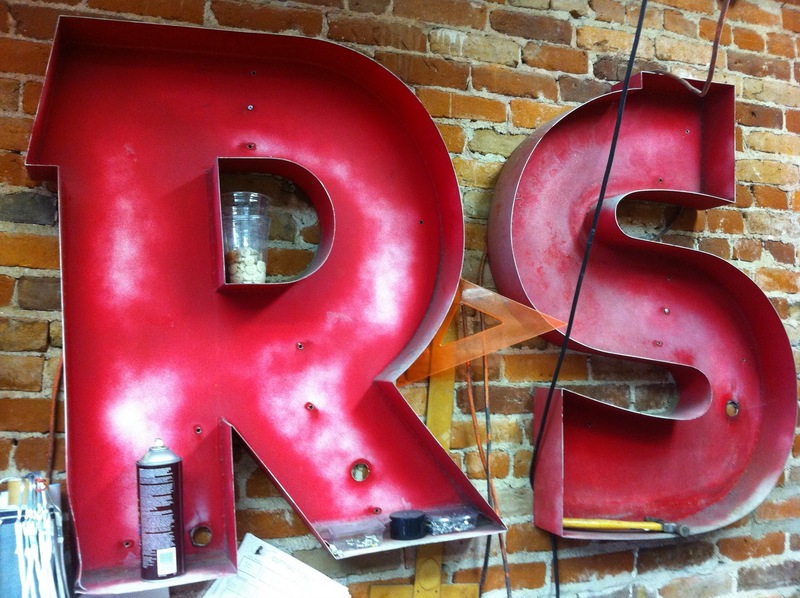 Be sure to stop in and pay them a visit when in town or check out the Rising Sun website for more information & details. Nice one! I bought a L over the phone last night! Hey Matt, Big props to Mike & Co. on this one! I was gonna reach out to give you a heads up but of course you are already on it. You are gonna love this vest. Looks Perfect! The vest couldn't fit you better!! Money well spent for sure! very cool. 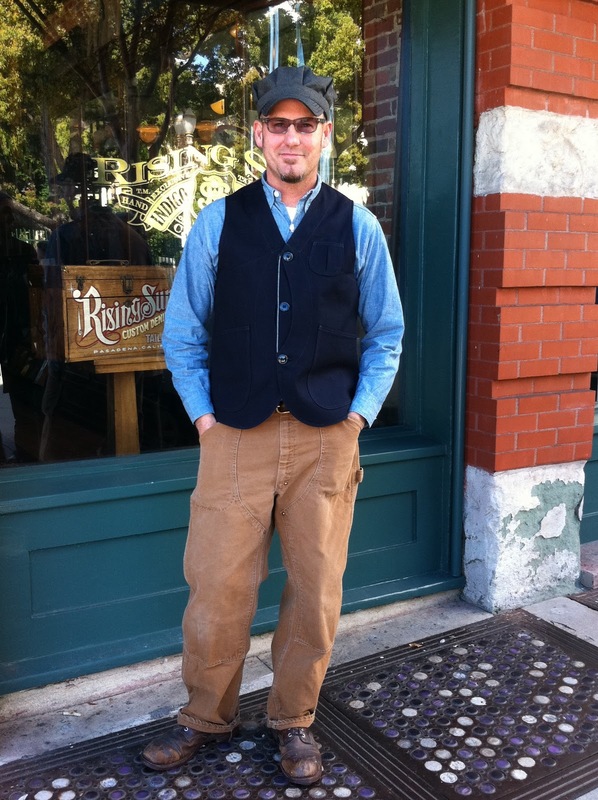 Love the vest and the hat too. 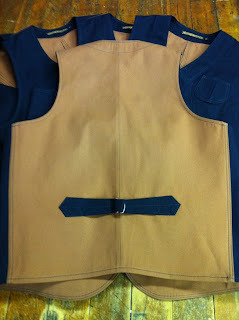 How's the vest coming along? Love mine! Getting some denim rub off though...think I should soak it?